Install Kodi on Raspberry Pi with Android Phone - No PC Required! How to Install Kodi on Raspberry Pi Using Android Smartphone NO PC REQUIRED! This tutorial shows you how to install Kodi on Raspberry Pi with Android smartphone or tablet. Now put your Micro SD card into your Micro SD to USB OTG adapter. Then insert the Micro SD to USB “OTG” adapter into your Android phone, which allows you to plug a standard size USB device directly into your phone by converting the USB plug to Micro USB. Don’t have one? They’re about $8 on Amazon. Your phone should says “USB device recognized” or something similar after you put it in the smartphone. Now Open the SD Card Manager app on your Android phone. Now press the Trash can icon (“Delete”) to erase / remove everything from the SD card. Then launch the Pi SD Card Imager app. Now press the icon that says “Choose your device”. Then select the device that does NOT say “Internal Storage”. If you select Internal Storage, then the app may erase everything on your PHONE. We don’t want to do that – we want to select the option that is not internal storage, which your phone usually sees as “USB”. After you select the non-Internal storage device, press the “Select (YourSDCardNameHere)” button. Then press Write to SD. If the app asks you to select the device again, then select the device again and press Write to SD once more. If the app asks if you’d like to proceed, select Yes. Then the app will download and extract NOOBS to your Micro SD card. This step actually will actually install Kodi on Raspberry Pi with Android by copying the “NOOBS” operating system installer to your Micro SD card. When it’s done, it will say “Imaged ok”. At this point, remove the Micro SD card. 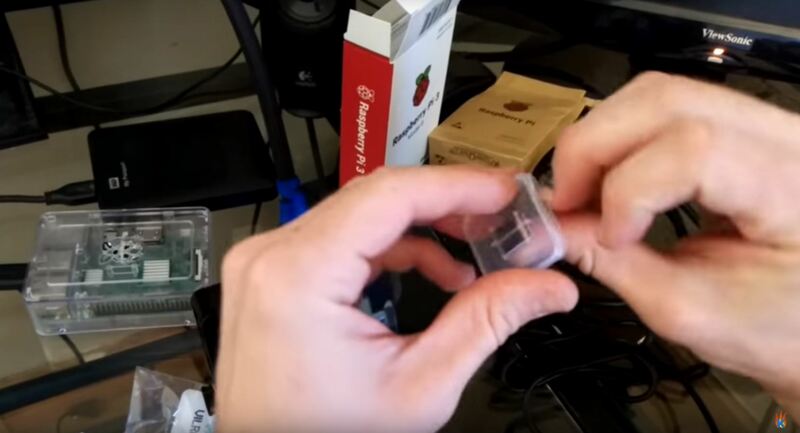 Make sure your Raspberry Pi is unplugged. Then insert the Micro SD card into your Raspberry Pi and plug the power in. After Raspberry Pi boots up into NOOBS, click OK to get rid of the “Network notification” message. If you have the Raspberry Pi Zero without WiFi, you’ll need to attach a USB hub and mini WiFi adapter. If you have the RPi Zero W (with WiFi), then just select your WiFi network and enter your WiFi password. The list of operating systems will refresh. Check the box next to any operating system in the list (we recommend LibreELEC, which is the RPi version of Kodi!). Then click Install. Wait for the Raspberry Pi to download LibreELEC. When it’s done, click OK and reboot your Pi! After RPi reboots into LibreELEC (“Kodi”), select your WiFi network and enter the WiFi password into LibreELEC. Now install TV Addons by using our easy Kodi 17 Config Wizard video tutorial. Finally, make sure to follow my Kodi VPN setup guide to protect & unblock your Kodi streams! Here’s my YouTube Kodi tutorial video that shows you how to install Kodi on Raspberry Pi using a PC. You can follow the video below for some of the steps to install Kodi on Raspberry Pi 3 with a PC. Just do with your Android phone the same thing I do in the video using my PC: Clear everything from the Micro SD card and then copy the NOOBS Lite over to your Micro SD card!